Matt Crafton, driver of the No. 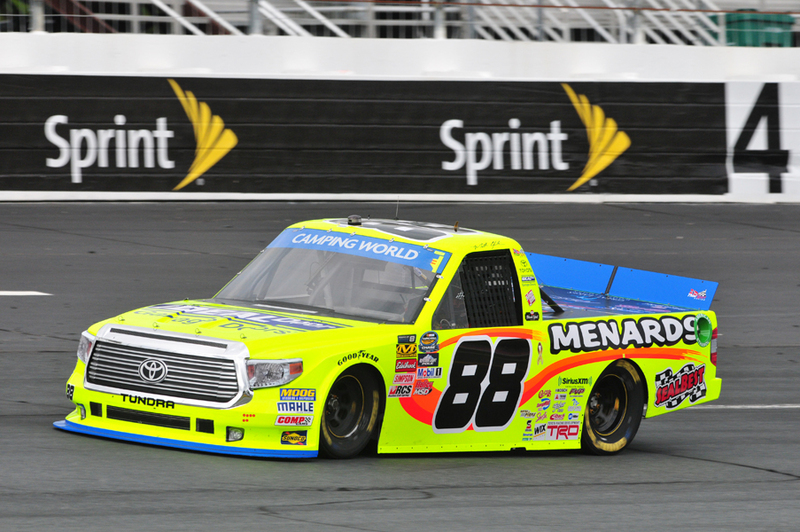 88 Ideal Door/Menards Toyota Tundra, made his 14th start at New Hampshire Motor Speedway in Saturday’s NASCAR Camping World Truck Series UNOH 175. Showing speed in both practice sessions on Friday, the two-time champion backed up his speed in qualifying Saturday morning, earning the seventh starting position for the first race in Round 1 of the Chase. With only two races remaining in Round 1 of the Chase, Crafton is currently scored second in the standings. The top-six drivers will transfer to Round 2. What was the first Truck Series Chase race like? The NASCAR Camping World Truck Series (NCWTS) had two practice sessions on Friday in preparation for Saturday’s UNOH 175 at New Hampshire Motor Speedway (NHMS). Matt Crafton was sixth, and first, respectively, in both sessions. Making his 14th NCWTS start at NHMS, Crafton started seventh, ran as high as second, and finished third in the 175-lap event. In 14 starts at NHMS, Crafton has led the field for 37 laps en route to four top-five, and six top-10 finishes. In 17 starts in 2016, Crafton has one pole (Atlanta), two wins, and has led 421 laps en route to six top-five, and 12 top-10 finishes. In 378 career NCWTS starts, Crafton has earned 12 poles, led 2110 laps en route to 13 wins, 95 top-five and 222 top-10 finishes. Crafton’s ThorSport Racing teammates finished 15th (Rhodes), 17th (Abreu), and 19th (Hayley). Up Next: The DC Solar 350 at Las Vegas Motor Speedway on Saturday, October 1, 2016.